The amounts of trash we produce each day are incredible. According to the U.S. Environmental Protection Agency, the average American produces almost 2 kilos of garbage per day. That’s more than double the amount produced in 1960, and it’s 50 percent more than the amount produced by Western Europeans. Today’s garbage is not only an expression of waste and environmental degradation, it is also travelling thousands of kilometers and in some cases American trash can be found in India’s landfills. 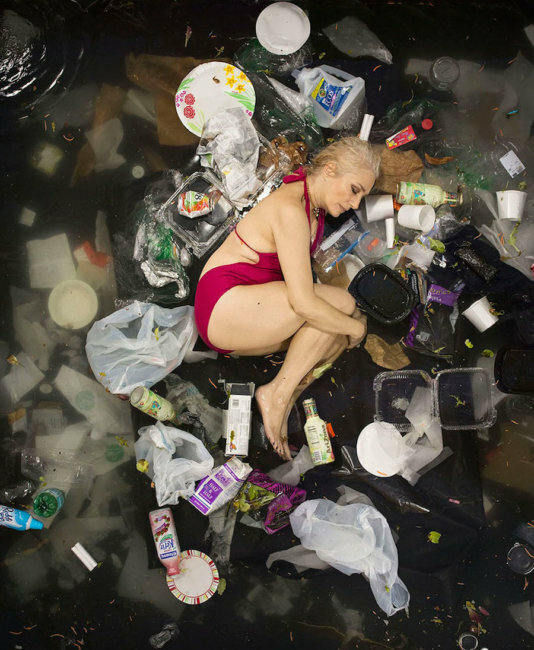 California photographer Gregg Segal attempts to put a face on the mountains of garbage we generate through his compelling series documenting families lying down in weeks’ worth of their own garbage. The ability to see one’s garbage, visualizing it, can be shaking. 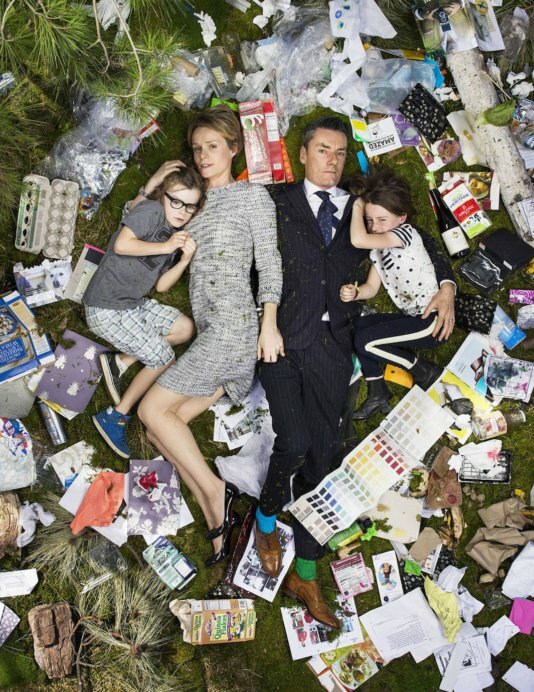 Segal explains the frank series of photographs, which depict ordinary people of all ages surrounded by all manner of trash (some of which appears to be recyclable! ): “7 Days of Garbage is a series of portraits of friends, neighbors, and other acquaintances with the garbage they accumulate in the course of a week. 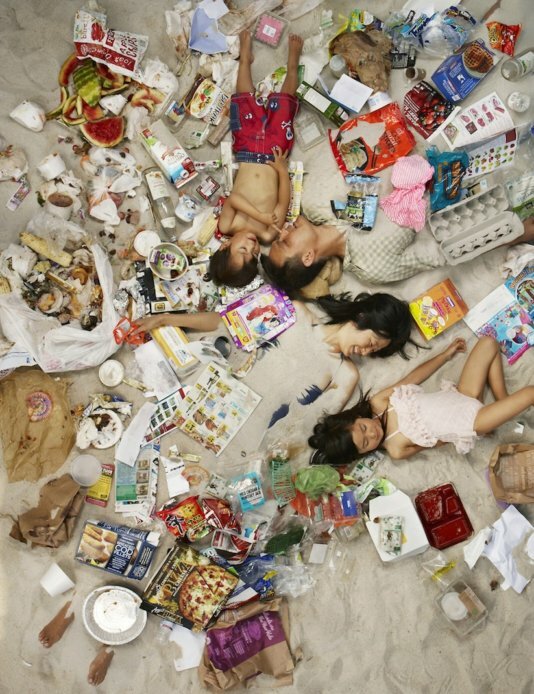 Subjects are photographed surrounded by their trash in a setting that is part nest, part archeological record. We’ve made our bed and in it we lie”. Segal's aim is to get viewers to see that in order to tackle the enormous waste problem, one has to start at the personal level, where it all begins - even if it means starting small. Funnily enough, Segal admits in a recent Slate interview that some of the subjects actually edited out some of their garbage, leaving out some of the "really foul stuff." Yet those who brought everything actually ended up with the best images, showing the truth behind this series: that what we throw away also defines who we are, and that we would do better by being honest with ourselves. 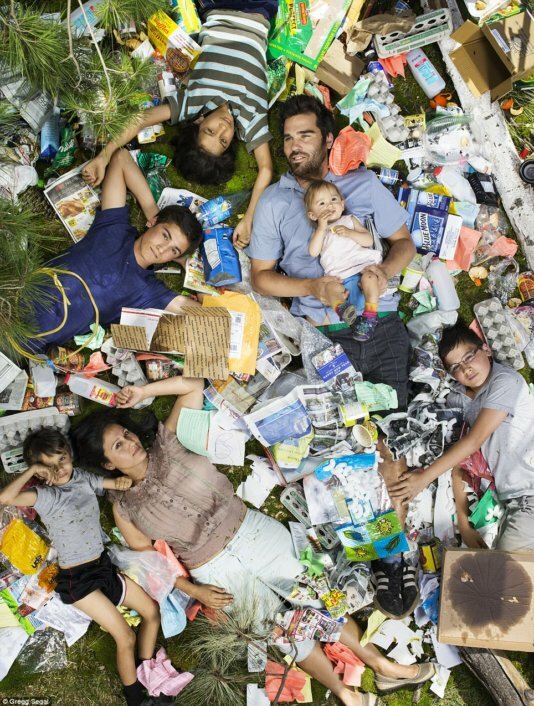 This photo series is a sharp contrast to a growing movement that hopes to achieve Zero Waste. There are many examples out there of people dramatically reducing their waste, and there are many ways to do just that. In 2009, the writer Colin Beavan (aka No Impact Man), has ended a one year journey with his family in NY, trying to live without creating waste or over consuming. His try has become a documentary. Another pioneer in the field of non-waste is Bea Johnson, the author of “Zero Waste Home: The Ultimate Guide to Simplifying Your Life by Reducing Your Waste”. In 2006 Bea and her family embarked on a life changing journey. They got rid of 80-90 percent of their belongings, including a second car, and found a 140 sqm home within walking distance of amenities. According to her blog, the Johnsons produce 1 litter of garbage annually, that’s about half of what the average American family produce in a week. To learn more how she did it, you can read her blog.